Quick Tip: An APH Night Before Christmas. Who else is ready for some holiday fun? Dr. M. Cay Holbrook Awarded APH’s 2017 Wings of Freedom Award Cay Holbrook has been an important member of the APH family for over 20 years. Her accomplishments have strongly benefited the teachers, students, and families we proudly serve. Her professional credentials as a vision teacher in several states, as vision program director and assistant professor at Johns Hopkins, associate professor at the University of Arkansas at Little Rock, and professor at the University of British Columbia, make her uniquely qualified to guide projects and author policies that make us, and our field, stronger. Quick Tip: Individual Calendar Kit. Help kids get ready for the new year with the Individual Calendar Kit! Here it is! December 2017 APH News! This month, APH is transforming access as dramatically as braille did back in the 1850s with the introduction of BrailleBlaster™ software. On the seventy-sixth anniversary of the attack on Pearl Harbor, we tried to find something that applied to remember the day, but we don’t have that kind of collection. But we do have a PEARL! The Plate Embossing Apparatus for Raised Lines was invented and designed by APH engineer Gary Davis in 1984. To my knowledge, only two were ever made. The PEARL is a metal tooling machine that functioned much like a sewing machine, only instead of stitching fabric, it embosses raised lines on metal embossing plates used to create tactile graphics. About four feet wide, the PEARL is all business with its gray paint and stainless steel hardware, so in that regard it does reflect those ships on battleship row. The operator sat in front of the machine and fed the plate under the tooling arm. Although most of our tactile graphics production has gone digital, we still have a PEARL ready to produce plates for jobs that run on our Heidelberg Presses. Photo shows a boy reading braille. Technology has been a boon for everyone and people who are blind or visually impaired have benefited a great deal from the availability of, and perhaps, more importantly, the efforts to make technology fully accessible.There are more ways to learn and access information and entertainment than ever before, thanks to these advances in technology. While this has provided great cause for celebration (believe me, we at APH are the biggest fans) it has also come with some misinformation and incorrect assumptions about the need for braille.Let me begin by saying these advances will not take the place of braille as e-readers will never entirely replace printed materials. Our object this week is a fundraising poster for the Rochester Eye Bank. "Mommy! I can See Again! “ is printed on the yellow poster with a black-and-white illustration of a young girl holding a rag doll. 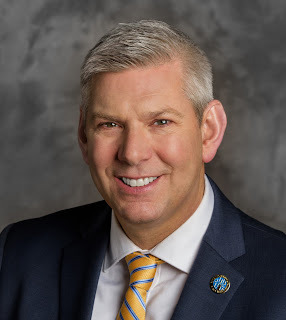 The Rochester Eye-Bank and Research Society was founded by the Rochester Downtown Lions Club in 1952 to retrieve and store eyes for corneal transplants and research. The first successful cornea transplant occurred in 1905 in Europe, but the creation of eye banks to store eye tissue was critical to the success of the endeavor. The first eye bank in the U.S. was founded in 1944 in New York City. The eye bank in Rochester closed its doors in 2015. Quick Tip: 2017 Holiday Gift Ideas for the Artists in Your Life. Watch Kerry and Michelle show you 3 great gifts for artists with blindness, low vision, or typical vision. Everyone has dreams. That’s one of the many ways people who are blind or visually impaired are exactly the same as people who are typically sighted. We all have dreams and hope we can make them come true. People who are blind or visually impaired dream of getting an education, going to college, and maybe earning an advanced degree. They dream of jobs that bring them satisfaction and independence. They dream of participating in their communities and our society. They dream of achieving everything they set out to do—just like everyone else. At the American Printing House for the Blind, we believe accessibility is for everyone, everywhere. But as we all know, most cities and communities aren’t fully accessible to people who are blind or visually impaired. APH wants to change that, and we took a big step forward by asking people who are blind or visually impaired what they want and need to navigate the world independently. Over the summer, we conducted a survey at major field conferences asking participants to give us their definition of an accessible city and community. We interviewed 397 people, including those who are blind and visually impaired, as well as caregivers, family members, and practitioners in the field. We also received 436 online survey responses, making this the largest study of this topic to date. On the morning of December 6th, 1917, a French cargo ship loaded with explosives collided with a Norwegian freighter in the harbor of Halifax Canada. The resulting explosion killed about 2,000 people and the flying glass that resulted from thousands of windows blown out by the pressure wave injured the eyes of almost six thousand people and blinded 41 permanently. The large number of eye injuries turned out to an important event in both medical care for eye injuries and rehabilitation efforts for people who are blind. This week the archives at the Perkins School for the Blind commemorates the centennial of this awful event and its aftermath by posting documents that tell the story. Perkins has several other online exhibits that are equally fascinating. 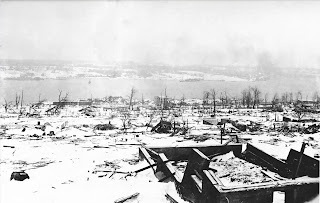 Photo caption: View of the Halifax Harbor area after the explosion. Every tree and building in sight is shattered and broken. Everything is covered in snow. Quick Tip: Joy Player Cartridge Field Test! APH seeks field test sites to test a newly designed digital cartridge for the Joy Player. Our object this week is a wooden frame with small compartments in a twenty by thirty grid. There are metal types with a raised Arabic numeral on the end that fit into the “cells.” Originally called an Arabic Slate, this style of math aid was developed in Paris, France in the 19th century. One source from 1910 called it the Paris Method. This particular model, known as an Arithmetic Type Frame, was developed in 1936 at APH as an instructional aid for working problems in long division, multiplication, subtraction, and addition. The supplied lead type was called Philadelphia Great Primer Type. In 1959, APH introduced the Texas slate to replace the Arithmetic Type Frame. The second image shows you a close-up of the raised number types. Quick Tip: Reach And Match Learning Kit. The Reach and Match Learning Kit is an innovative system for students with sensory impairment and other special needs to help them learn while engaging with their peers. Did you ever wonder why we call capital letters “upper case” and non-capitals “lower case”? They are printing terms. 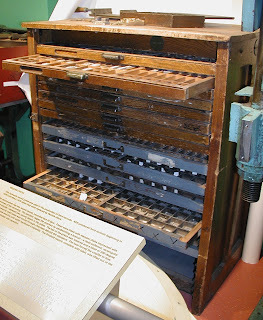 From the origins of printing, Mr. Gutenberg and all that, some poor fellow had to sit with a “case” of printing type and lay out the page in a frame called a “galley” one letter at a time. The capitals were in the top drawers of the case and so on. Our object today is a cabinet of printer’s type. The angled top allowed the typesetter to place his galley frame there while he loaded it with type from the drawers, or maybe rest a drawer there while he unloaded a previously used arrangement. APH used type in several ways. In more modern times, we used traditional type to print labels on book spines and Talking Book records. In our early days, we used specialized type to manufacture raised letter books, the tactile books that preceded braille. 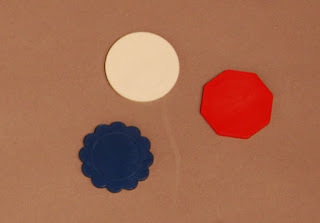 Quick Tip: Tactile Compass for Math and Art. The Tactile Compass for Math and Art is an excellent assistive tool that enables students who are visually impaired to draw tactile circles. Quick Tip: Pegs and Pegboard. Get your students’ attention and foster visual development, eye-hand coordination, awareness of spatial relationships, and matching and sequencing skills with the Pegs and Pegboard! 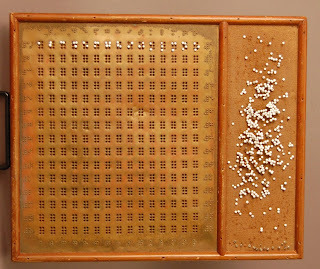 Our object this week is a braille pin board which belonged to a home teacher of blind students in Connecticut named Corrine Delesdernier. She attended the Perkins School in Watertown, Massachusetts and died in 1957. 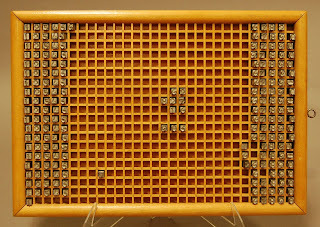 Her wooden frame contains a brass board with 225 perforated braille cells in a fifteen by fifteen grid. The rows are numbered in braille one to fifteen and the columns are lettered “A” through “O”. A cloth cushion on the right stores push pins that can be used to create raised braille symbols. 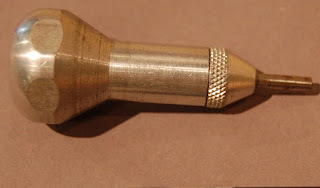 Most of the pins have white, round plastic heads; a few are steel pins with clear glass heads. I have most often seen these types of boards used to create braille crossword puzzles. The Royal National Institute for the Blind in England sold a similar design in its 1933 catalog. The frame of the pin board is clearly stamped “PERKINS INST FOR THE BLIND” although it is not clear if it was made at Perkins or purchased by them. Quick Tip: APH Annual Meeting 2017. The APH Annual Meeting is like a yearly homecoming for those in the blindness field, giving us opportunities to catch up, meet new people, and network with old friends and acquaintances. 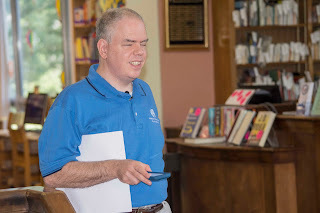 APH News is your monthly link to the latest information on the products, services, field tests, and training opportunities from the American Printing House for the Blind. This week, visitors to APH’s 149th Annual Meeting will be able to navigate inside the Louisville International Airport using the new Indoor Explorer feature of our Nearby Explorer™ app for iOS®! 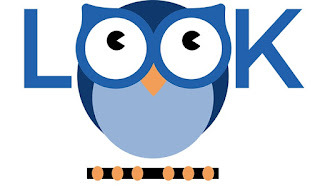 Look is a reading tool created by CVI SCOTLAND, with multiple functions and settings, designed to make reading easier for people with CVI. Look can be used for all levels of reader, from a non-reader learning to read, to an experienced reader wanting specific settings to read faster and more comfortably. Look enables the user to insert any text (up to 10,000 words), and adjust the settings, to read a single word on an uncluttered screen, and either change each word manually, or set the speed for Look to present the words automatically at your comfortable reading speed. Quick Tip: NewT. There’s a new APH kit in town! It’s called NewT: New Tools and Activities for use with APH’s Functional Vision and Learning Media Assessment. See why this kit has become so popular so quickly! The BD-3 was Triformation's first braille embosser, released in 1971. The BD-3 was the first commercially available digital braille embosser in the U.S. On the outside it looks like a normal American Tourister suitcase. On the inside you get the deluxe mid-century faux woodgrain table with a reel of paper tape, a covered embossing head, and a small row of switches, lights, and jacks. It was described as a "braille verifier," producing braille copy on paper tape as regular copy was typed, either by a teletype machine, or a computer terminal. It weighed 15 pounds and cost $1,850. 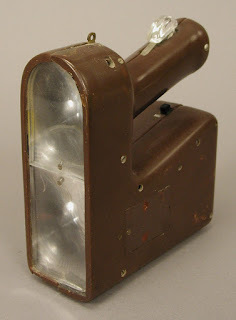 Triformation's full sheet embosser, the LED-120, became available in June 1974, and although more expensive, $9,000, it was much more popular. Quick Tip: Explorer Bright Ray. The Explorer Bright Ray is a new head-worn LED lamp to help adults and students with so many activities! Quick Tip: Slapstack Math. Slapstack Math is an action and memory game that uses virtual math flash cards instead of playing cards. Quick Tip: ECC Icon Poster. The ECC Icon Poster is a wall-sized print/tactile poster that lists the Expanded Core Curriculum skills important for the specialized instruction of blind and visually impaired students. Quick Tip: Protein Synthesis Kit. The Protein Synthesis Kit builds upon the DNA-RNA Kit and provides students who are blind and visually impaired with another sturdy and dependable model for molecular biology. Our object this week is a common Talking Book phonograph from around 1974. I really like the bright colors that the NLS was using back then. 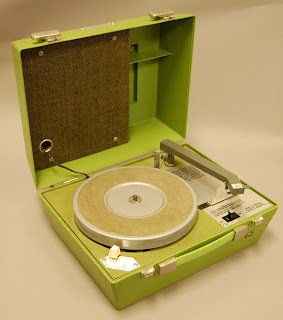 This one is green and the speaker is mounted in its removable lid. The passage of the Pratt-Smoot Act in 1931 created the National Library Service for the Blind and Physically Handicapped. The act was amended in 1933 to include talking book service. 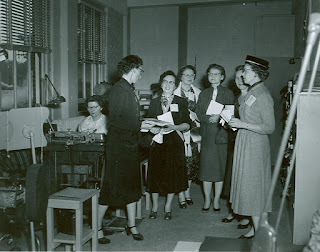 The WPA began manufacturing talking book machines for the NLS in 1935. The first commercially purchased machines were bought by NLS in 1947. The first transistorized machines, like this one, appeared in 1968. Three speeds appeared in 1970. This example was owned by Eva Morton, an alumni of the Kentucky School for the Blind. Quick Tip: The Solar Eclipse at APH. On August 21st, 2017 during the solar eclipse that journeyed across the US, for the first time in history, individuals could experience a tactile representation of an eclipse that changed in real time. Also check out the video of individuals actually "Touching the sun" using Graphiti. Quick Tip: Bear Hunt in UEB. Bear Hunt, an award-winning tactile book, is an exceptional vehicle for building a foundation for early literacy. 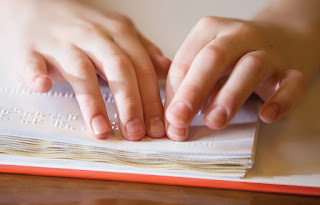 It provides the perfect recipe to stir up a desire to read in young emergent and early braille readers, as well as readers of all ages and visual abilities. The talking wallet recognized paper bills and announced their value. It was developed by the Boston Information & Technology Corporation in cooperation with the American Foundation for the Blind(AFB). In a 1992 edition of AFB's Braille Monitor, BIT’s President, Mohymen Saddeek, reported that roughly 150 were manufactured before the company failed in a dispute over the product. There are many tools that supply a voice reading of the information normally gained by sight. Such aids include the talking scale, clock, watch, timer, blood-pressure monitor, thermometer, blood-glucose monitoring kit, talking wallet, label makers, calculators, and computer-speech output. 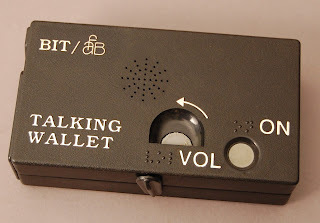 Photo caption: The Talking Wallet was black plastic, about 4x6 inches, and opened up to accept the paper bill. Throwback Thursday Object: Flyer Announcing a Concert by Students from "The Perkins Institution for the Blind" from 1873! Our object this week is a small paper broadside from 1873. In bold print letters it proclaims the appearance of “Mr. J.N. Marble and his associates from the Perkins Institution for the Blind” for a “Concert at Town Hall.” These were likely pasted up all over town and handed out on the street. John N. Marble was a student from Massachusetts at Perkins between 1868 and 1871. Samuel Gridley Howe, the superintendent at Perkins, regularly exhibited his students all over the country, but this show was a money making venture. It cost a quarter to get in. We can’t be sure whether “Town Hall,” where the program was staged, was the Old City Hall in Boston or in some other community. The repertoire featured a variety of popular tunes, primarily American, and concluded with “America,” although that song was not the “America the Beautiful” so familiar today. That old favorite was not published until 1910. Quick Tip: National Instructional Partnership (NIP) Events. APH sponsors National Instructional Partnership Events with experts in the field to initiate national, state, and regional training opportunities for parents, consumers, and personnel who serve children who are visually impaired. Use the OrCam to Identify Objects, Read Print and More! The following article comes from Hannah Ziring of OrCam Technologies. I have read about this device, viewed YouTube videos about it, and saw it in action very briefly at one of the summer conventions. You may find the device quite useful for the reasons listed in the article. The OrCam device is a smart camera that sits on the user’s glasses and reads text aloud to people who are visually impaired or blind. ”, it definitely looks that way. The device is so small and discreet, it is barely noticeable. Besides its compact size, there are many amazing OrCam features that make the device unique and accessible. Our object this week is a humble wooden workstand, made and used here at the American Printing House and painted a nice industrial gray. Historic photographs show similar custom-made tables in a variety of shapes and sizes used as work stands in a number of processes around the building. In this picture of the stereograph room where embossing plates were made, you can see a table much like this one in the left foreground. These tables are an endangered species around APH today. A few years ago our production department installed a Kaizen construction area where our production staff can put together special purpose tables and materials carts in a jiffy from metal tubes and particle board. I guess you could say that these old work tables were the Kaizen equivalent of their day. Quick Tip: Sense-able Ways to Build Tactile Literacy Skills. Karen Poppe, Tactile Graphics Project Leader, recently presented a session entitled "Sense-able Ways to Build Tactile Literacy Skills" at the AER International Orientation and Mobility Conference in Pittsburgh, PA.